The banking and financial sector has expanded dramatically in the last forty years, and the consequences of this accelerated growth have been felt by people around the world. 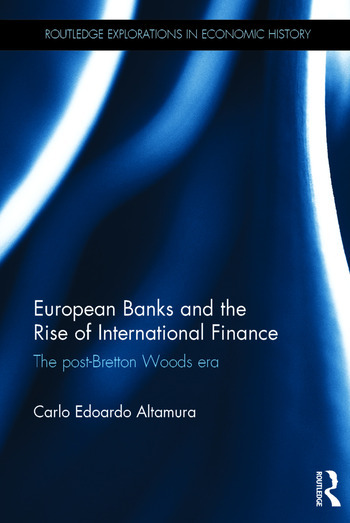 European Banks and the Rise of International Finance examines the historical origins of the financialised world we live in by analysing the transformations in world finance which occurred in the decade from the first oil crisis of 1973, until the debt crisis of 1982. This a crucial and formative decade for understanding the modern financial landscape, but it is still mostly unexplored in economic and financial history. The availability of new archival evidence has allowed for the re-examination of issues such as the progressive privatisation of international financial flows to Less Developed Countries, especially in Latin America and South-East Asia, and its impact on the expansion of the European banking sector, and for the development of an invaluable financial and political history. This book is well suited for those interested in monetary economics and economic history, as well as those studying international political economy, banking history and Financial history. Carlo Edoardo Altamura is a postdoctoral fellow at the Paul Bairoch Institute of Economic History at the University of Geneva, Switzerland, a visiting college research associate at Wolfson College, Cambridge, UK, and a visiting scholar at the Faculty of History of the University of Cambridge, UK. His interests lie in post-war banking and financial history in the West and in the developing regions.